Yoga has been part of my life since childhood. My parents practiced themselves and my dad is a Yoga teacher. I’ve always felt an affinity with the practices, breathing and philosophy and this has only deepened through my years of training, teaching, pregnancy and mothering. Mothering brought my practice into sharp focus; rather than it being solely some stretchy postures and relaxation we do on the mat, it became the values from which I lived and sought support. I realised mothering demands all of our attention when babies and children are small and Yoga provided the physical, emotional, mental and spiritual guidance and sustenance which supported me as I loved and nurtured my children. I feel wholly blessed to be supported by Yoga in this way, and in every class I teach I endeavor to pass on the ways in which Yoga can support and sustain us on all levels of our being and as we journey through pregnancy, labour and mothering. So as I reeled from the shock, pain and trauma of a recent accident and subsequent bone and ligament injuries, despite the overwhelm around and within me, I knew I had access to a treasure of sturdy wisdom, healing and support. In the immediate aftermath, I kept with my breath, deep and slow, with a long exhale to help me reduce my panic and keep consciousness. Over the following days, weeks and months, the 8 limbs of Yoga provided guidance, hope, healing, support and reassurance. Conscious, Yogic breathing has been the mainstay of my physical and emotional recovery and is the essence of my personal practice and teaching. Breathing is the essence of Yoga. Whatever is going on around and within us, we always have the opportunity to connect with our breathing. Following our breath keeps us in the present moment and is a lifeline through torrents of fear and anxiety and it is the flowing, conscious breathing which lies at the heart of my Pregnancy Yoga and Birth Preparation teaching. We can anchor on to the flow of the inhale and the softening of the exhale. I worked with the breath to keep my mind in the present moment, to keep focused and conscious and to soften my body and get through the manipulations and X-rays at hospital. Over the weeks and months that followed, my breath was my anchor, breathing in deeper than the pain or emotion I was feeling, observing, listening, and letting myself drop down deeper than these feelings and let go with the exhale. As I felt panic and traumatic images in my mind, I went to my breath; slow inhale, long, soft exhale, signaling to my body that all is well, that all is safe; letting my nervous system know the stress hormones can ebb away. There is nothing like a series of long, slow exhales to reassure the body we are not in danger, to signal to the nervous system that the adrenaline of fight and flight is no longer needed. I did this regularly and often, and along with support from homeopathy, flower essences and talking with friends, found my way through this difficult time. 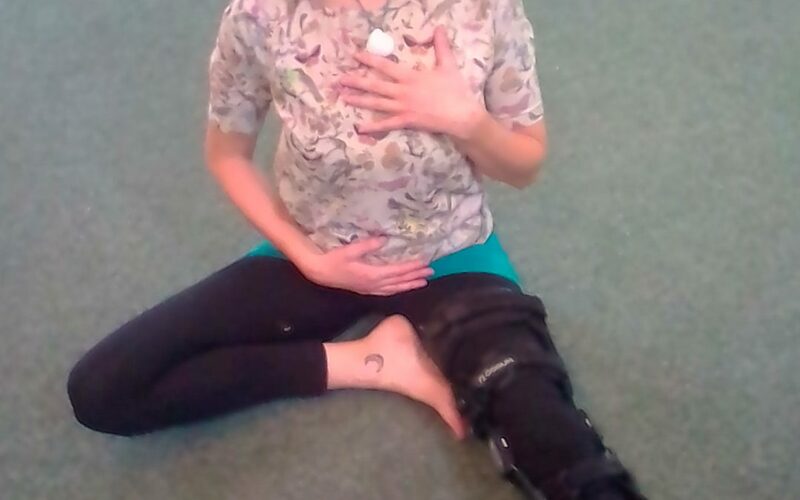 When I felt pain, I brought my attention sharply onto my leg, and directed my breathing to what I was feeling, as I teach in preparing mums to breathe through the intensity of their contractions, I breathed deeper than the pain, scooping it all up with the inhale, and soothing and letting it go with the exhale. I kept this conscious attention on my pain, and really felt connected to what was happening with the injury as it changed over time. One of the most important ways of encouraging the body to heal is bringing it into a state of deep, therapeutic relaxation. Conscious Yoga relaxations and Yoga Nidra, translated as Yogic Sleep brings the body into a deep state of rest and stimulates healing and renewal through mind and body. I knew I could fight what was happening and be frustrated and resentful about being stuck in bed for weeks, or I could shift my mindset into a more nurturing place and work with the Yamas and Niyamas of Yoga, the ethics and spiritual guidance which teach acceptance, gentleness towards the self and all others and much more. So I began a path of deep acceptance; accepting, and later embracing the time I must be laid up, and practiced 3 or more Yoga Nidras each day. This is normally unheard of in our day to day busy lives, and is the stuff of dreams and expensive Yoga retreats! So as I felt the fear rising and the horrible flashbacks, an idea crept in that I could pair these feelings with Love and Safety. So following my instinct I then created feelings of love and wellbeing, and working with the development of this trauma and love over the following months. What emerged was a strong, beautiful, empowering and most of all effective practice which enabled me to move through feelings of trauma in a healthy and positive way. As a Yoga Therapist, this was exciting to watch, and I look forward to sharing these practices in Yoga Therapy sessions with others looking for a holistic path through trauma and recovery. A central part of each relaxation and Yoga Nidra practice were my sankalpas, or positive affirmations. I affirmed how I was safe and well to help stabilise my nervous system after the trauma, and how well my leg was healing naturally. Such affirmations are the seeds we plant of the qualities we would like to cultivate and enjoy in out lives. I affirmed these regularly, and cultivated their growth into reality through my continued conscious practice. Alongside the Nidras, I worked with Pranavidya… this involves moving and directing the energy of the body through visualisation. I worked with seeing the blockages the injury was causing, and bringing healing and sustenance from my chakras and other areas of my body, helping flow and balance to return and healing to ensue. I also worked with the healing, supportive energies of the Earth and Angelic realms, bringing stability, Light and healing to my knee and my whole self. We have such a lot of help available and Yoga teachings offer the tools to understand and access this. Again I look forward to sharing these practices though Yoga Therapy. When people think of Yoga, its often the flexible postures that come to mind, yet these are only the tip of the iceberg. They are important, but only one aspect of the overall practice. So obviously I wasn’t up on the mat doing Sun Salutes, but what the physical practices did offer was a way of keeping the rest of my body well and releasing the muscle pain and tension from the trauma and bed rest through my back and shoulders. Gentle, rotational practices, the Pawanmuktasana energy freeing work of spiralling through the joints and limbs helped to ward off stiffness and keep energy flowing in the rest of my body. I hoped these movements would prevent further swelling and ward off potential blood clots. So as I kept my knee locked in the brace, I gently worked on the rest of my body. This felt like a really nurturing way to look after the rest of myself, and through the attention I brought to these practices, came across areas of lesser trauma and injury I had received in my hips, spine and neck. As my knee stabilised over the coming months, I created a simple programme of limbering and strengthening Yoga to aide recovery by listening carefully to what my knee was experiencing, and moving with awareness around this and within the limits of pain. Keeping with my programme of listening to my body and moving with awareness, I began weight bearing and eventually brought myself back round to walking, first with, then without crutches, going up and down stairs and slowly getting back on my feet and returning to teach my Pregnancy Class albeit still in the knee brace. I also received regular acupuncture and felt a significant difference with the swelling and improved circulation each week. I’m still waiting to see the Consultant again, but I can feel real improvement and stability. There is still some pain, I’m still not driving, and I can’t do everything I’d like to at the pace I usually would….but perhaps this is a good thing! I’m excited to see how Yoga and physio will continue to guide me through this journey of recovery and the insights and learning I’ll encounter. Life can bring us some huge challenges and difficulties through body, mind and emotions, yet it is my experience that whilst Yoga can’t always change what happens to us, it can certainly provide a beautiful collection of tools to nurture ourselves through times of challenge and vulnerability, helping us connect with ourselves more deeply, and allowing us to experience such times as a deepening into ourselves, heralding new learning, insight and deep healing. Clare offers Pregnancy Yoga & Birth Preparation classes and One to One Yoga Therapy sessions for overcoming trauma and all aspects of Women’s Wellness. Her forthcoming book Milestones of Motherhood explores women’s inner learning and transformation through mothering as we learn to love and nurture our children.